The AIM NetworkNews and PoliticsEmbracing 2019: Re-Igniting a Progressive American Revolution? Embracing 2019: Re-Igniting a Progressive American Revolution? The re-democratisation of the US is reflected in improved voter turn-outs at the mid-term elections on 6 November 2018. 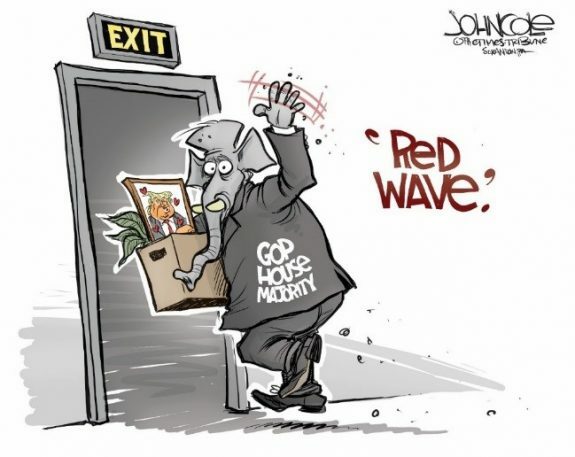 The Blue Wave to the Democratic Party in the Senate this time was not fierce enough to over-turn the majority for the Republican Party. The new senate balance is now Democrat 47, Republican 53 and two independents, including the left-leaning Senator Bernie Sanders of Vermont. The net loss of two senate spots by the Democrats occurred despite a favourable nationwide swing of 5.5 per cent. The national senate vote reached 59.3 per cent for the Democratic Party. The Blue Wave in the contestable senate spots did not make it to Florida, Missouri, North Dakota and Indiana which were all re-gained by the Republicans to off-set Democrat gains in Arizona and Nevada. In Texas, Republican Senator Ted Cruz survived with 50.9 per cent of the vote despite a swing of 6 per cent to challenger Beto O’Rourke. O’Rourke vacated his Congressional District 16 in Dallas to contribute to make an unsuccessful tilt at the senate to assist with Democrat efforts to gain control of both houses of Congress. Senate spots were highly contested in the swing states where one third of the senate is elected every two years with special votes to confirm appointments from death or retirements. In the State of Michigan, the votes from the college cities of Lansing and Ann Arbor as well as increasingly de-industrialised Detroit offered protection from a possible Red Wave to the Republican Party. As in Britain after the Tony Blair landslides in 1997 and 2002, a change of administration does not necessarily bring a change in policy direction on all fronts. Even President J. F. Kennedy (JFK) was still under the clutches of the military intelligence networks after his narrow victory in 1960 and a status quo result at the 1962 mid-term election. Having accepted CIA intervention in Cuba in a futile attempt to topple Fidel Castro at the Bay of Pigs, JFK was able to hold the line against military solutions to the Cuban Missile Crisis with some moral support from both Nikita Khrushchev and Pope John XXIII. The CIA got its way in South Vietnam with the coup against President Diem just three weeks before JFK’s own assassination on Friday 22 November 1963. Permit me to use some illustrations from the mid-term election results in Pennsylvania which includes the City of Philadelphia. In Pennsylvania, voter turnout jumped from 43 per cent at the 2014 mid-term election to 58 per cent in 2018 (WITF 19 November 2018). This turn-out was still lower than at the 2016 presidential elections. In parts of Philadelphia and the Allegheny hinterland, east of Pittsburgh, the turn-out rate was over 60 per cent. College towns in Allegheny County east of Pittsburgh added to the Democratic vote attained by Senator Bob Casey with only minor total leakages of 1.6 per cent to the Greens and Libertarian candidates. In Pittsburgh based, Congressional District 18, the Republicans did not contest the election. However, in Allegheny County on the eastern outskirts of Pittsburgh and into the adjacent college towns, the high rates of voter participation gave 65.7 per cent of its support to Democratic Senator Bob Casey. The Democratic Party achieved a net gain of three districts and the state is now evenly divided between the Republican and the Democratic Party. District 1 as well as Districts 9-16 are still in Republican hands. Districts 12-15 recorded Republican votes in the 66 to 70.5 per cent range. Gerrymandering of congressional districts was an important weapon for the Republican Party. This protects the Republican hue in District 1 in Pittsburgh by concentrating Democratic Party support in the adjacent Districts 2 and 3. The seat by seat analysis of the district results inn Pennsylvania is well covered in articles from Politico. There has been a revolution in the gender balance of congressional representatives from Pennsylvania with an increase in female representation from zero in 2014 to four. All women are from the Democratic Party. The zero representation for women prior to 2018 was repeated in the congressional districts of ten other states. On election night, 55 of the 65 women in the House of Representatives were Democrats. “They won’t be Trump fans, to put it mildly,” he said. The women ran on numerous issues, but they also had an anti-Trump message in their platform, even if they didn’t say the president’s name. “Tonight, we’ve changed the face of Congress,” Dean said. “Our politics and our government have been turned upside down, and together I hope we’re going to turn our country right side up again. This is not the end of our journey. We have only just begun this fight, and we have a lot of work to do now,” Houlahan said. “The real fundamental question we’ve really got to ask ourselves is, what type of a society do we want?” Evans said in a recent campaign stop, criticizing the GOP (Republican Party) tax cuts for helping corporations and the wealthy while driving up the deficit and leaving less room for needed domestic programs. Ignored by the national elements of his party, Leib, 33, called out CNN anchor Jake Tapper, a Philadelphia native, on Twitter in mid-October, trying to get some coverage. On the trail, the businessman and leader of the city Young Republicans argued that one-party Democratic rule had not helped the city. An estimated 56 percent of the district’s population is African American, according to the data journalism website FiveThirtyEight. Two years ago, Hillary Clinton took 91 percent of the vote in the precincts that now comprise the newly re-drawn Third. The progressive traditions of both Australia and the US would be vastly strengthened by more critical news reporting and cultural activism. These results were a snub to the more traditional style of campaigning by Democratic campaign bosses. The more engaged US electorate surely demands responsible policy risk-taking over the endless use of predictable rhetoric. The precedent of taking good-will from Republicans for the benefit of the wider community is a reminder of the history of the Woodmere Art Museum in the Chestnut Hill District of Philadelphia. The Museum and some of the art treasures were from the estate of Republican benefactor Charles Knox Smith (1845-1916). His wealth was derived from risk-taking in business, including mining investments in Mexico. This country is now being fenced off from the US and the polemics over this non-issue has shut down the US federal government. The twists and turns in this upcountry winter landscape are a reminder of the changes which both Australia and the US must make to remain vibrant societies in the years ahead. The promo for the current Pennsylvania Landscapes exhibition uses the work of impressionist artist Walter Elmer Schofield (1866-1914). It gives a cheerful light to the winter landscapes of Upcountry Pennsylvania from a work completed in 1913. This was the year of President Woodrow Wilson’s inauguration for two terms. After commitment to the Great War in Europe, a Republican-dominated Congress after the 1918 mid-term elections rejected the value of participation in the League of Nations to build a just peace. Shades of 1918 still exist in the rhetoric of President Trump’s America First Approach to the hopes of progressive globalisation. Denis Bright is a registered teacher and a member of the Media, Entertainment and Arts Alliance (MEAA). Denis has postgraduate qualifications in journalism, public policy and international relations. He is interested in advancing pragmatic policies compatible with contemporary globalisation. Leaders on both sides of politics should approach their work with the inspiration of the best artists.I agree with the sentiments expressed in Denis’ article. Definitely a great change in direction for the USA as noted in this second article on the mid-term elections. Great research and embedded messages for responsible change. It seems that Americans got caught up in a referendum for and against President Trump. Issues not well covered by a quite scan of internet news or the sensationalism of commercial television news. Should corporate news network be trusted as messengers? Thanks Denis! Very interesting overview of the midterms. The increased voter turnout is very encouraging. Sad to see Warren too gormless to stand against the Lobby. For the ‘progressives’ it might come down to Warren versus Sanders. A glance at the record will show that Warren did not back Sanders last time around. Perhaps she was thinking that far ahead? Gets to the foundations of contemporary campgaigning. Needed in both Australia and the USA to build change. The ‘tradition’ of reporting elections as a contest of personalities is popular in the msm and seems to be begrudgingly acknowledged across most forums. The ‘mid terms’ over there are reported on as a vote for or against the incumbent in much the same way as by-elections here are reported on as a vote for or against the government. As you illustrate so well, there were unbelievable representations by the people of America that are demonstrative of this misrepresentation. The candidacy of women, the advocacy of health and education policies, the move towards independents and so many other notable trends – which support the premise that voters aren’t the mugs that everyone portrays them as – were remarkably unremarked upon. There is much about the American system that mirrors ours that barely raises comment, let alone criticism. Most reporting is Republican V Democrat, as if the duopoly is the only game in town. Over here, most reporting is about Labor V IPA, oops, LNP, which belittles the sentiment of the people they claim to represent. The HofR saw massive changes in this structure, which the msm are loathe to analyse as it dispels so many of their precious ideologies. As for their Senate, it has 100 seats of which only 35 were vacated. Of that 35, 23 were Democrats. What was less reported on was that their Senate is like ours – vastly unrepresentative. Tasmania has the same senatorial representation as NSW, SA has the same as Victoria. The term ‘unrepresentative swill’ was coined for a reason. Does that ring any bells with anyone? Our government has been busy not only stuffing judicial bodies with partisan hacks, but creating new partisan judicial bodies and then stuffing them with partisan hacks. Even the ABC has been dismembered through this tactic. And then we get to the good bit. At last, a suggestion that a disbelief in a system so blatantly corrupted to favour a duopolistic model is NOT a vote against democracy as a concept, it is a vote against a broken system. We have a ways to go, but we’re getting there. Our current hapless PM is embracing 2019 in the belief that 2018 was an aberration, a non-occurrence. He too is ignoring that this revolution is more an evolution of a system that is broken. But this is the IPA and humour is not their strong suit. Screamed the headline, which left me wondering to whom the you was referring. Unfortunately, author, Sinclair Davidson, does not present where he believes the LNP is bad, and the rest of the article settled into the usual routine of Labor bashing. Davidson describes Labor’s policy on taxation and economics as “formidable“. However, after 27 years of continuous economic growth this is “policy complacency”. Apparently being formidable and complacent are not mutually exclusive. Given the usual far right mantra of Labor’s economic abilities, I thought this an interesting take. The USA has its Heartland and Australia, the IPA. Policy complacency is definitely a big problem on both sides of politics here and overseas. The centre-left does better when it takes risks that a compatible with issues of concern from the grass-roots. This does not mean taking up every radical issue but those issues which generate deep concern local electorates. Having a sprinkling of green members of parliament with a few from the hunters and shooters as well as the far right in the senate and upper state houses is a recipe for more of the status quo. With the NSW state election approaching, the experience of having a couple of green members really needs to be looked at again by voters. Ballina may have a Green member of state parliament, but there is still traffic chaos and no moves to built high speed rail link from Sydney or even to re-open the medium speed railway from Sydney to Byron Bay as the first phase of a Sydney to a new Gold Coast Railway to Coolangatta Airport at least which would serve all the local communities.